Hey guys, sorry for deserting you for two months, but needless to say, I've been a busy wee lass. 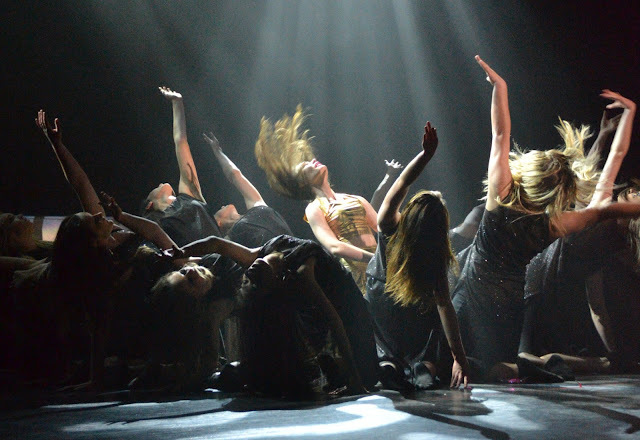 Last Friday, my school competed in Stage Challenge, which closed out the busiest four months I've ever experienced. So before I tell you about everything, I'll let you know what stage challenge is: an eight minute performance, usually done through dance, where you convey a message. Our performance this year was based around the idea of the dark side of money. The main character (played by my best friend and amazingly talented Cassie) is introduced to a materialistic world, and sees the downfalls of consumerism, losing everything to a world she wanted so much to be a part of. We didn't place in the competition (I may be biased, but we were robbed - we got beaten by dancing kiwi fruit and meningitis dancing to Skyfall of all songs, but oh well), but we got seven awards of excellence for Drama, Concept, Stage Use, Performance Skill, Costuming Character, Choreography and Set Design & Function (we were the only school to win that one so yay!). I will say something: I've never been so proud of anything in my life. And while I don't like tooting my own horn, I've done a lot to be proud of, but this one takes the top spot. This year, I got to direct the performance and I've been busy sorting everything out for the past four months. I was lucky to have an amazing group of choreographers who came up with the performance, and their dances were far beyond than anything I could have ever imagined. On the night, I sat in the audience crying my eyes out from the moment the performance started. While I've always loved the exhilarating feeling of performing, seeing something you've worked on so hard for so long was the best feeling in the world. Honestly. 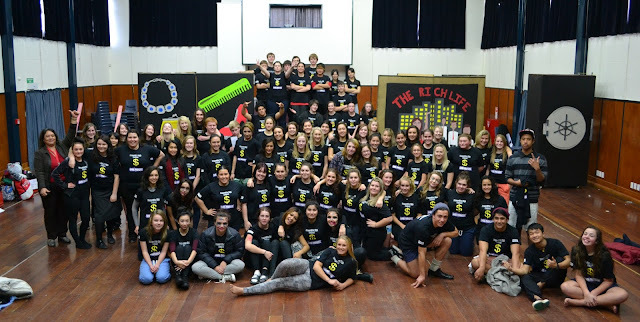 When we came to the end of the performance - where Cassie commits suicide by falling off the back of the platform (kind of a downer, but that's Dannevirke High School for you, we never do happy, cute endings where the whole cast comes on stage), I just cried and cried and cried. There was an overwhelming feeling of proudness that I'd never felt before, because everything came together so well: the dances were perfect, the costumes were amazing, and the lights finished everything off wonderfully. I also don't think I've ever hugged so many people - or embarrassed myself so much by crying in front of every important figure in the school (the principal, the teachers, the board members). They're probably wondering how I ever got Head Girl now. That time management is the best skill anyone could ever have, and luckily I have that skill pretty downpat. There were lots of rehearsals (we had 18 hours worth of rehearsals over four days, and me and a couple of others worked on the set/performance for 50+ hours in one of the school holiday weeks), but being Head Girl and also working at a place that was extremely understaffed, my life wasn't put on hold for Stage Challenge. Let's just say, I actually did lots of work in all my free periods and school, and even took homework to work to do during my night shifts. Somehow, through all this mess I managed to get an Excellence for a Biology assessment, which is great because Bio is my worst subject. Mind you, I haven't quite caught up on my sleep yet - probably need to go into a coma for a month to do that. The bags under my eyes speak wonders for how much work I've been doing lately. Being calm is also a great quality. We had a huge committee with a lot of strong minds, and while I had several down days because of some of the friction caused, when it came down to it, I thought I handled the major problems pretty well. There was one day that was particularly horrible, but we managed getting through it and everything went well in the end. Being able to count to ten and not jump to conclusions was probably the thing that got us all through. I drank too much coffee and bought a lot of food to get me through. Turns out that whole coffee was the best thing ever, I went the last two days without caffeine and I felt perfect. Still, stage challenge started my coffee addiction. I've never felt so much gratitude in my life. My co-director Emma was amazing. My choreographers were amazing. My dancers were amazing. My set guys were amazing. Cassie was amazingly amazing. But especially the people who saw all my mental breakdowns behind the scenes - sorry, but thank you. I'm especially proud of our achievements as we did this with no teacher assistance. Which is very different from previous years. Most of all - I love directing. I really do. Since I wasn't performing, these pictures of me 'in action' are as close as you're gonna get to seeing me participate in the production. I look like Steven Spielberg. Someone hand me an Oscar. This is our opening scene - three working girls hating life. All set to the tune of 'Money, Money, Money'. Just imagine the lyrics playing out on stage. The main character gets the idea that the rich life is just what she needs. This is our 'business dance', which is still set to Money, Money, Money. They basically lure Cassie into the 'rich life', and give her some money so she can go on her way. This is probably one of the biggest reasons as to why we won the only Set Design and Function award - our vault opens, some people come out of it, and then it closes by itself. Well, as far as the audience knows...but man, we did well with that one! Special thanks to Seth and Jared for making that piece of magic. Yeah hey, my name is Baz Luhrmann. This is when consumerism kinda bits back. The mannequins are all quite serious and all hate Cassie now, but she's totally oblivious. This is the business world gone wrong - everyone who has been chewed up and spat out by the demons of consumerism and have learned the hard way that money doesn't buy happiness. This is set to Lux Aeterna from the Requiem for a Dream soundtrack...yeah, I was going for the most depressing song I could find. This dance - set to Carmen by Lana Del Rey - is the last scene, showing the desolation and loneliness that valuing money over things like family and friends can do. Not only is this picture perfect, but this was easily my favourite part of our performance - I cried so much because the whole movement went so perfectly. DHS: bringing you happy endings at Stage Challenge since never. Now that it's all over, I will say that while I don't miss having to go up to school for 10 hours a day and stuff like that, there's plenty of memories that I miss from Stage Challenge. Like eating Chinese on the set after spending something like nine hours making it, or all the coffee runs, or just being around an awesome group of kids for a few hours. I'd like to say that now Stage Challenge is over, I can get back to blogging - but alas, my life has not stopped being busy yet. If you want to read a blog describing every fabulous facet of The Great Gatsby though, maybe I can help you there? Anyway - another public thank you to everyone involved with this project - and a public thank you to you guys for making me pass 600,000 hits even though I'm not a regular poster! What's been going on with you guys in the cinematic world these days? How was Man of Steel? How bad was After Earth? How are all the 2013 movies going - because I sure as hell don't know! Let me know in the comments! That piece had to be just eight minutes long? Damn. Looks like a very packed eight minutes. We miss you at the blogging world but I'm glad you are doing all these awesome things. And I loved Gatsby too! Leoooooooooo. As one aspiring filmmaker to another,good job. Right now im trying to get a simple 5 page script short film done, and even that has been a challenge. So i commend you for getting a whole stage production done. Congrats Stevee, it looks amazing, you should be proud! I see a big future ahead for you! So, when you'll become a big time director, can I say I kinda know you? :P Just kidding! Glad you loved The Great Gatsby. I really enjoyed it too.